Mr and Mrs Obama are generally seen supportive to each other whenever they appear in public. But a recent report claims that all is not well and a storm is brewing under the public smiles for Obamas. 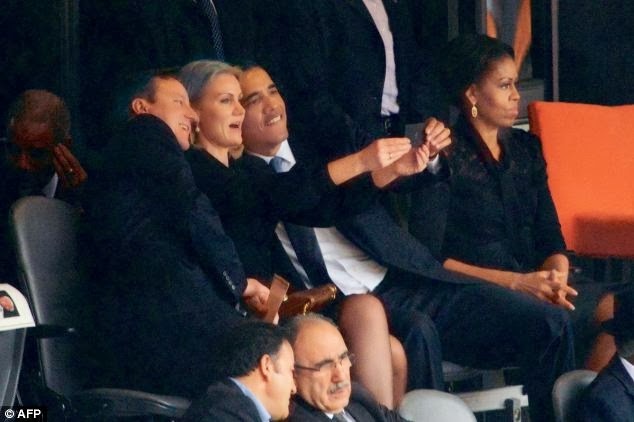 The last time they were pictured together — at Nelson Mandela’s memorial — the First Lady was looking none too pleased as the her husband posed for a ‘selfie’ photograph with the leggy blonde Danish Prime Minister, Helle Thorning-Schmidt. The report even goes to the extent that the magic couple may split after Obama's presidency term comes to an end in 2016. Even two earlier books have claimed that they duo came to split in early 2000's, , with Mrs Obama even drawing up divorce papers after deciding his burning political ambition was ruining their chances of domestic happiness.